Almost everybody has a GoPro or alternative action camera nowadays so it is not a question why selfie sticks are so popular! 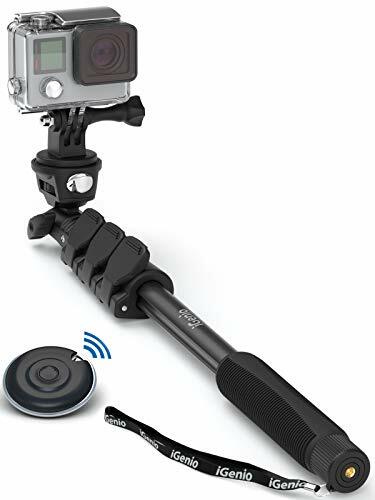 The stick’s main function is to allow you to take photos of yourself even if you are alone, but there are further advantages: mounting your camera on a hand grip or pole allows you to move closer to your subject as well as gives extra stability. In order to get the maximum flexibility make sure to have waterproof selfie stick that you can use in all weather conditions. Don’t let snow, rain or salty water stop you capturing your memories! An underwater selfie stick is the best way to record every moment while snorkeling, diving, kayaking, surfing and any other water activity. Using a monopod is an essential accessory to get the perfect photos in your everyday life or while traveling. 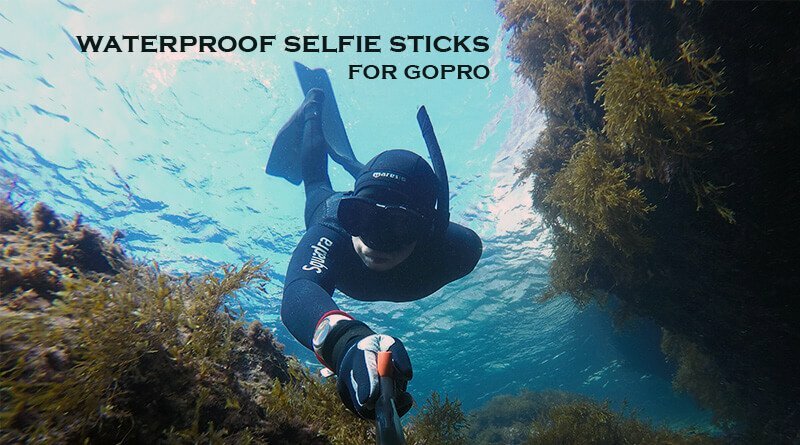 To use it in wet environments or in the sea, we recommend using only waterproof selfie stick. Water, especially salty water damages metal parts even after a few uses resulting rusting and stuck screws. Although you might not plan to use your monopod underwater, rain and high humidity also might cause corrosion and damage. The best choice is to buy waterproof selfie stick that you can use worry-free every time! 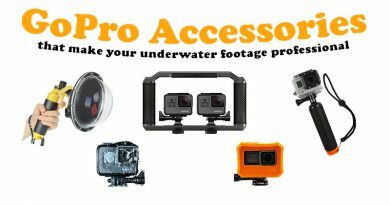 Mounting your action camera on an underwater selfie stick is a big step to get better footage, but to know what professional use to increase the video quality read our GoPro accessories for diving and snorkeling guide. 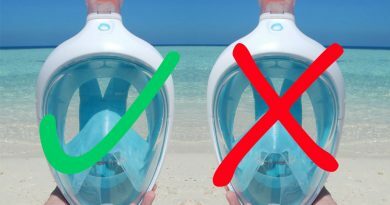 Tip: Even if your accessories are waterproof, make sure to rinse them thoroughly after using them in salt water to get rid of sand and salt. 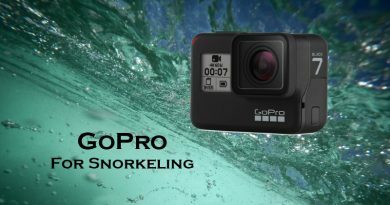 If you don’t have an action camera at the moment, check out what GoPro is the best for snorkeling! 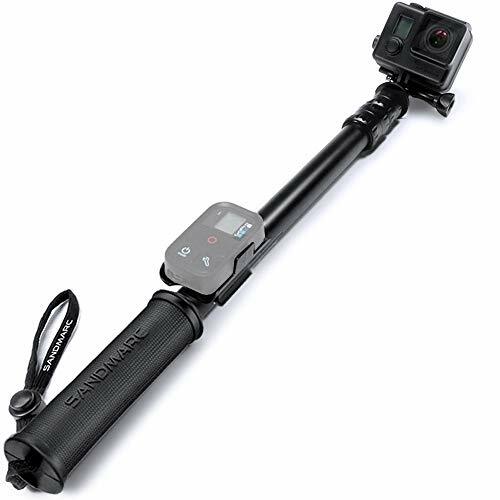 This sturdy GoPro pole made of durable aluminum to be tough enough to withstand any weather conditions. 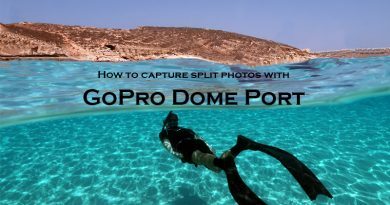 Use it while snorkeling, diving, kayaking, surfing and even for winter activates. The aluminum thumb screw and tripod mount are designed to fit GoPro cameras. You can use it as a stick in closed position or as a long camera pole if extended (size between 17-40”). The rubber grip makes it comfortable to hold in hand. Lightweight, extra-long, multifunctional extendable waterproof selfie stick with quick-release clips. 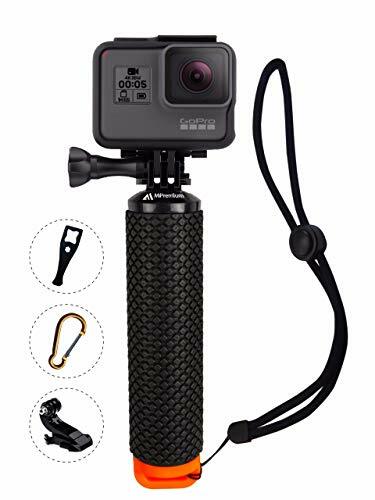 This weatherproof monopod can be used not only with action cameras but as a waterproof selfie stick for phone and for digital camera as well. Size between 15-47 inch. Bluetooth remote shutter for smartphones is included in the package. 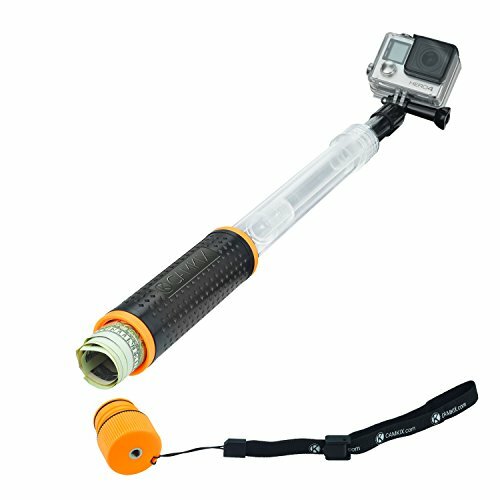 2in1 waterproof pole that can be used as a handgrip and a floating selfie stick. It floats in the water so won’t sink although you can fill in the hand grip part with water to achieve neutral buoyancy. Otherwise, it can be used as a watertight compartment. The transparent material makes it nearly invisible on photos when used as a pole! The separate transparent part is adjustable between 6.7’” and 15.7”. Portable and lightweight extendable pole that is compatible with almost all action cameras. Easy to carry in a backpack or even in your pocket and safe to use indoor and outdoor. Although it is not a floating pole, designed especially for wet use with quality aluminum tube and rust-free screw. Soft rubber grip makes it comfortable as well as secure to hold. Quick twist and lock function make easy to use it as a handler or a longer pole. Size 7.25-19”. The smallest telescopic selfie stick that fits even your purse or pocket! Compatible with action cameras, iPhone, and other smartphones too. Quick and easy twist-and-lock system that makes Luxebell stick easily extendable between 6.6-18.1 inch. Made from rust-free aluminum allowing saltwater use too. 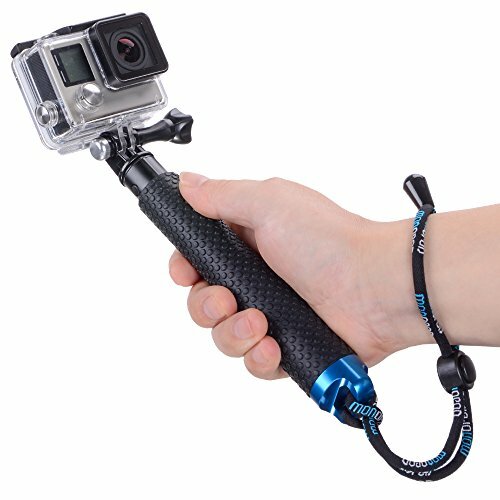 If you find selfie sticks to bulky but still want to mount your camera in order to get stable footage, get a hand grip! The easiest, simplest and cheapest solution that not only provides you smoother footage compared to hand-help videos but also keeps your camera afloat so you won’t lose it anymore! 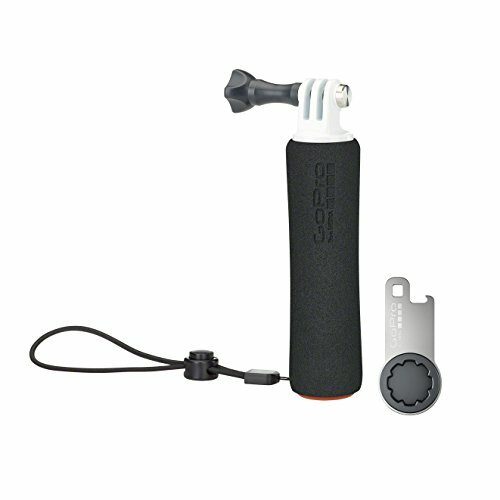 A GoPro handgrip is like a compact and lightweight travel size mini pole that can be used underwater and even in saltwater. There are simple plastic models available known as Bobber. Newest models come with removable cup equipped with O-ring which makes them functioning as watertight holder too. 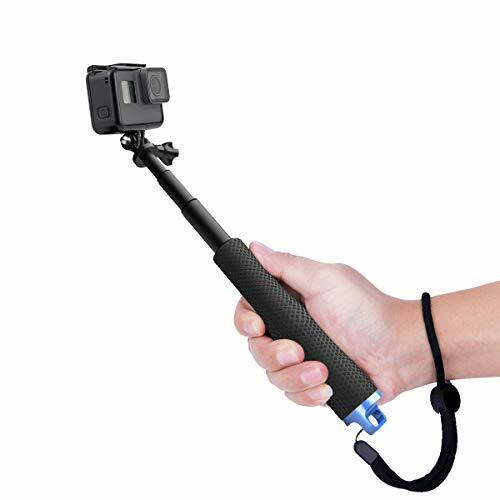 7-inch long compact size, easy-to-carry pocket-size floating waterproof selfie stick. Watertight compartment with multi-use options: use it to keep your small items dry or fill it with water for neutral buoyancy while diving. To maintain the floating function, do not fill in with water! Non-slip handle for secure and comfortable hold. Easily visible thanks to vibrant orange cup. ProFloat Hand grip comes in package with useful accessories like carabineer, wrist strap, J-hook and thumb screw. The original GoPro floating hand grip. Covered with non-slip coating for secure grip and waterproof up to 33 ft (10m). It is able to float any camera with BacPac accessories. Vibrant orange knob makes it visible in the water. GoPro Handler comes with an adjustable strap and thumb screw. Make your GoPro float! Bobber high visibility floatation device was made to keep your camera afloat in the water as well as to make your steady or POV footage stable. No need for adapters, connects directly, compatible with all Hero cameras and can be used with BacPac accessories too. Non-slip rubber grip. With the included strap you can firmly secure it to your wrist. When not in use you can easily attach it thanks to the carabineer attachment. 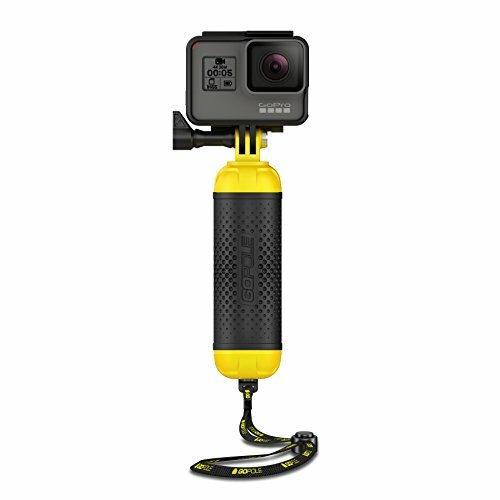 High visibility floatation device designed for action cameras including latest Hero 6/5 models too. Durable rubber cover to prevent slipping and provide secure hold. 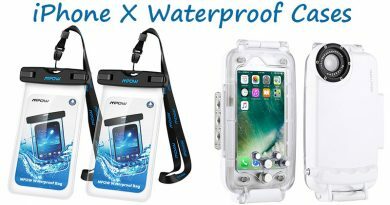 Amazon floating grip is fully submersible, waterproof up to 16ft therefore recommended for snorkeling, surfing, kayaking. Package includes wrist strap to secure the floaty.